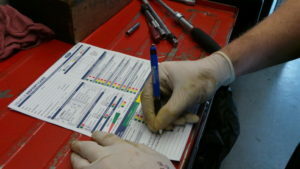 When you regularly visit the Quick Lane Tire and Auto Center you will appreciate the report card’s simple red, yellow green scoring system that keeps you aware of your car’s upcoming maintenance needs like tires, brakes, auto batteries and more. If you are ever in need of a little extra help the Quick Lane also offers a credit card with an easy application process and extended special interest financing plans with low monthly payments. For more information see any Quick Lane Service Advisor.